*Improved 2017 Model. Sturdier design, wobble free, interlocking joints for maximum stability. (please note these will not fit our previous non interlocking joint models) * Made from Australian Beech Wood. Very classy and elegant yet solid furniture grade hardwood. Hand made from solid Beech Hardwood. High quality, smooth solid wood. No tools are required, pieces simply fit together like lego blocks and locks in place. 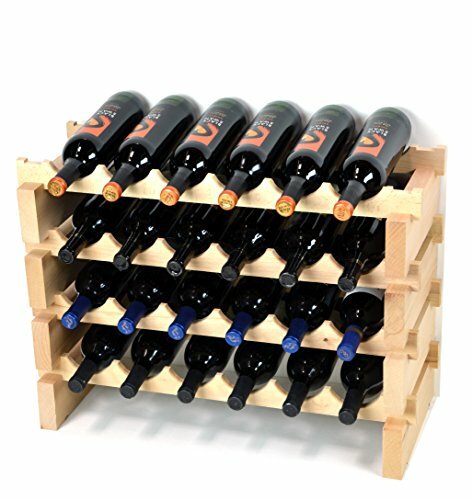 Stackable, 6 bottles wide by 4 shelves high racks, giving you a total storage of 24 bottles. If you have any questions about this product by sfDisplay.com,LLC., contact us by completing and submitting the form below. If you are looking for a specif part number, please include it with your message.